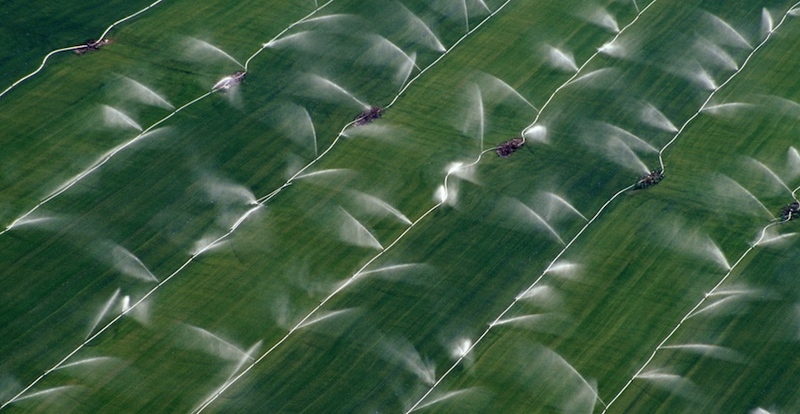 Aerial view of crop sprinklers near the Sacramento-San Joaquin Delta region. A full-length documentary highlighting the relationship between water, food security and, ultimately, global security, features UC Merced researchers and is scheduled to premiere Sept. 14 in downtown Merced. “Beyond the Brink,” a new film from accomplished writer, producer and director Jim Thebaut, aims to show the interconnectedness of water and food scarcity, climate change and national security. In it, he interviews researchers from around the state and the University of California, including UC Merced School of Engineering professors and water experts Roger Bales, Martha Conklin and Joshua Viers. “Who’s a more reliable source than the UC?” asked Thebaut, a graduate of UCLA and University of Washington, and the CEO of The Chronicles Group, a nonprofit dedicated to providing visual and educational records for the public about profound issues facing the 21st century. Thebaut, a regional environmental planner who wrote the country’s first environmental impact statement, has made several documentaries including “A Tale of Two Cities,” comparing Seattle and Los Angeles. His work has focused on water for several years now. His films “The American Southwest: Are We Running Dry?” and “Running Dry, The Cold War and Beyond” have been well received by scholars and policy makers. “Running Dry” prompted lawmakers to author the Paul Simon Water for the Poor Act, in honor of former Illinois Sen. Paul Simon, who foresaw and wrote about the coming global water crisis, especially for vulnerable populations. The act requires that the U.S. oversee USAID water, sanitation and hygiene programs and expand the program in high-priority countries. He approached UC Merced in part because of UC Water, which Conklin, Viers and Bales co-lead. The intercampus research initiative is designed to study and generate solutions to California’s water challenges. But the implications of the work could have a much farther reach. The film will delve into water from the peaks of the Sierra Nevada — California’s natural reservoir — to the aquifers of the Valley floor, touching on forest management, water information, agriculture, restoration of groundwater, subsidence, desalination, drought, public health and national security. The 30-second trailer for "Beyond the Brink," which premieres Sept. 14 at the Merced Theater. Bales and Conklin’s interviews took place in the mountains, as much of their work with the Sierra Nevada Research Institute (SNRI) and the Southern Sierra Critical Zone Observatory involves mountain hydrology, the health of meadows as natural water storage, the snowpack and forest management. The film will include discussion of climate. The day the film crew captured footage of Bales and Conklin near the 7,000-foot Badger Pass in January, there was about a meter of snow, which is average, Bales said. But it was all beginning to melt earlier than normal. What happens in the mountains affects the rest of the water system, and right now, the system is “out of whack,” she said. Groundwater has been grossly overpumped and land-use policy has left few ways for it to be replenished. Viers and UC Davis Professor Graham Fogg — who is also interviewed in the film — are working on project in the Sacramento Delta, moving levees along the Cosumnes River to see if restoring the floodplain to its natural state will help recharge the aquifers. So far, progress has been remarkable. Although he didn’t interview any elected officials for “Beyond the Brink,” Thebaut said he wants to make sure legislators see it. “Beyond the Brink” premieres Sept. 14 at 7 p.m. at the Art Kamangar Center at the Merced Theater. Doors open at 6 p.m. and admission is free, but seating is limited. Attendees are encouraged to RSVP at snrievents@ucmerced.edu.